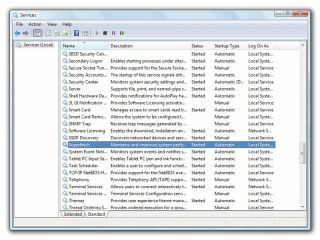 SuperFetch is a system of RAM management that preloads your installed memory with your most frequently used programs. It's designed to improve performance, though some gamers and specialist users have claimed to notice speed gains after disabling it. As the technology adapts to your usage patterns, though, it's more likely that disabling SuperFetch will make your system feel more sluggish. SuperFetch was introduced in Windows Vista and has been retained in Windows 7. It manages the use of data cached in RAM to ensure quick access to it when needed, thus reducing the amount of times that data is loaded directly from the hard drive (which has significantly longer access times). SuperFetch reduces boot times by tracking which files need to be loaded at which times during the boot process. This information is stored in a trace file so that it can be used in future, enabling it to use your RAM to make these files more accessible at these times. It also works with Windows' defragmenter – the utility that maintains your hard drive's efficiency by reuniting fragmented files and putting commonly used files in more accessible parts of the drive. This ensures that files used during boot are stored on your hard drive in the order in which they're needed for easy access. You can examine this order in the file 'Layout.ini', which is in the Prefetch directory within your Windows folder. To ensure that your apps launch quickly, SuperFetch preloads the most popular ones into memory based on your patterns of use. It takes into account the order that you generally load applications to try and anticipate your routine. It also examines differences that occur at different times of the day, so the preloaded applications for morning use may be quite different to those that you launch for some evening recreation. Just as it does during boot, the service takes note of which files are accessed in which order when each application is launched, making sure that these are available in RAM when called upon. If you still want to, you can disable SuperFetch in the same way that you disable any other service. Click 'Start', enter services.msc into the Start menu Search and press [Enter]. This opens the Services utility on a console. Scroll through the services until you find SuperFetch. Double-click it and click 'Stop' to stop the service. To permanently disable it, select 'Startup type: Disabled' and click 'OK'. Think carefully before you take this step, though, because SuperFetch is a somewhat misunderstood service. Despite the fact that it's been tipped as a candidate for disabling in online articles, doing so could have the reverse effect to the one desired.